Hello Bob, Evan, and the anonymous dozen. Holst, excellent choice. I have that one on vinyl. Thanks, Jesse, and hello, Flash! Boy, that's a hell of a photo of Tomita...sitting inside his control room/cockpit. I remember pick up a few Tomita LPs when I was a freshmen in college, and I asked an older guy (who was about my current age), "this stuff is rather cheesy, right?" And the guy said, "yeah, but you'll still enjoy them". And enjoy them I did. Hey, Mr. Flash Strap, are we on our way to Eden? 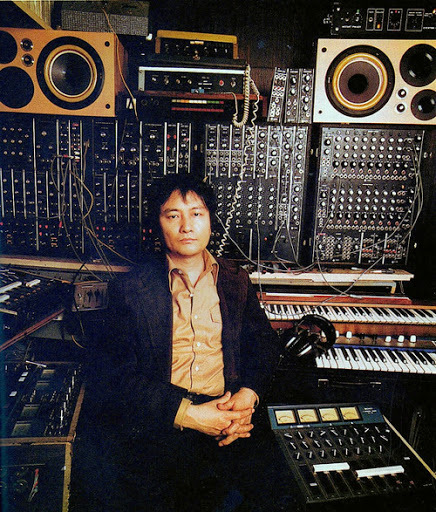 But I was thinking: shouldn't we think of guys like Tomita or (maybe) Jean-Michel Jarre as diluted versions of the avant-garde electronica of the 50s and 60s, which also made long, trippy tracks with lots of futuristic assumptions behind it? My 18 year-old self had rather different tastes then my current self. Well, I'm not sure I'd say diluted. They definitely emerge from the same continuum. And they definitely take a more populist approach. But I think a valid case can be made for their methods as equally fascinating and equally valid. Even equally experimental, albeit not in as radical a way. I wouldn't call them avant-garde. Hey there, Sean G. Thanks for backing me up on that. Really digging the music. I like cosmic. I guess tastes vary as to the goofy voice effect. To me, it is a rapture. I haven't heard this album..., wow! You're right, it's probably awfully close to something Stockhausen would have said. I have a friend in the Moog foundation, and it's basically his job to articulate that same argument. Hey, @Gary! Yeah, I was there, I spoke to Gaylord Fields, but he didn't know you too at the time. But that's OK, it was my first time in NYC and I hope it won't be the last! man, this is farrrrrr out! ..really great show. Glad i tuned in! This full on Tomita is great! Thanks Hambone and Bas! Gosh! yeah! that's the cool thing about these popular artists like Tomita/Jarre, or Les Baxter and Esquivel or whoever: they bring this stuff into the suburban den, where it must seem especially weird. And yet not. I have actually not seen Silent Running! Really? I only remember it from late-night TV when I was a teenager, but it left a deep impression on me, maybe it was one of my first encounters (no pun intended) with ecological /man-nature discussions, besides 2001: A Space Odyssey. I can't remember the soundtrack, but I remember it as vaguely in the same style of music. @Flash Strap Silent Running is worth a watch. Little slow. Great effects. Bruce Dern. It's really weird to hear Tomita's sound applied to something so thickly Russian. It makes more sense in a Romantic/Exotic vein, but the folkoric elements here are like, Slavic. This isn't his best record by a long shot, but it has some great, deeply bizarre, feelings in it. Just wanted to say that was an interesting Close Encounters tribute. thanks for the cool show. You say Tomita...I say Tormato. How Uncular of you, Miguel! This is SUCH exceptional stuff! Thank you for putting together this continually great show -- there is nothing like it out there!